It's a late winter day along Mill Creek. 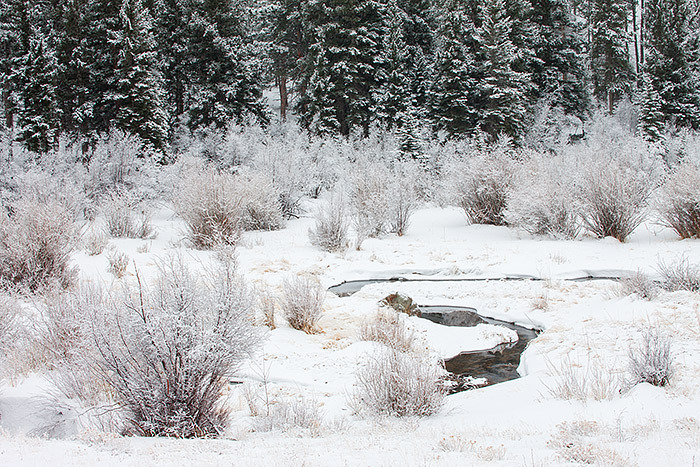 Snow is falling on the willows and pine that surround the small stream on the east side of Rocky Mountain National Park. Winter is strating to lose her grip and Mill Creek has broken free from the ice and is now flowing freely. Subtle hints of reds and yellows can be seen in the grasses along Mill Creek adding a slight touch of color to this beautiful winter scene. Photo © copyright by Thomas Mangan.